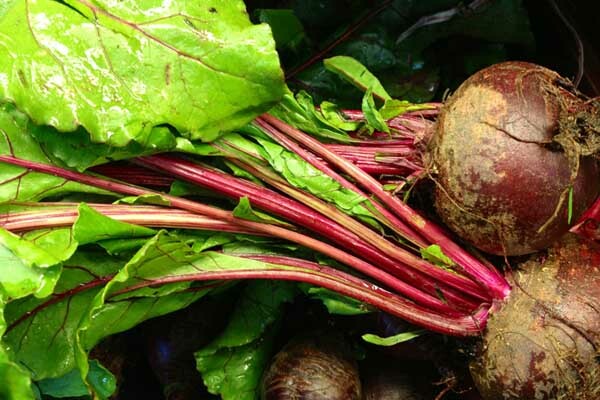 Beets are one of the latest ‘it’ health foods – how many times have you heard how nutritious and cleansing beets or beet root can be for you? I must confess to being a lifelong beet hater. I would even go as far as admitting that in the past if I was served a plate of food that had even a drop of beet juice near it the whole plate of food would go in the bin! Now none of that has changed and I still will not go near a pickled beet or its crimson juice but I have found much to my surprise (and that of my mothers) that not only can I eat a beet without plugging my nose and gagging but I actually enjoy them! So how can I do this you might ask. The answer is simple, I have discovered roasted beets! And if you are a true beet hater an extra trick is to buy the golden ones as the colour is much like a potato and the sweetness will remind you of a very mild sweet potato. Golden or red, cut them into small wedges, roast in a light coating of coconut oil, and toss in cumin seed or curry powder if you fancy and you too will be scarfing them down. Roasted and thrown into the following salad with pistachios and roasted onions you just cant go wrong for a super side dish or main meal. Give it a whirl and you may be a convert too even if you are a self confessed beet hater like me! 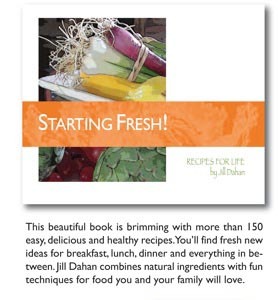 Cut leaves from the root part of beets and reserve for greens. Peel the beets and then cut into wedges. Reserve good leaves and place in a bowl of cold water; chill until needed. Heat oil, split between two roasting pans and toss onion wedges in one and beet wedges in the other. This will ensure the color of the beets does not bleed on the onions. Roast both at 375ºF (190ºC) for about 30 minutes. Remove the onions and roast beets for another 10 minutes, or until tender. Remove and set aside. Blend vinegar, olive oil, and garlic until combined and then add thyme. Remove beet leaves, pat dry. 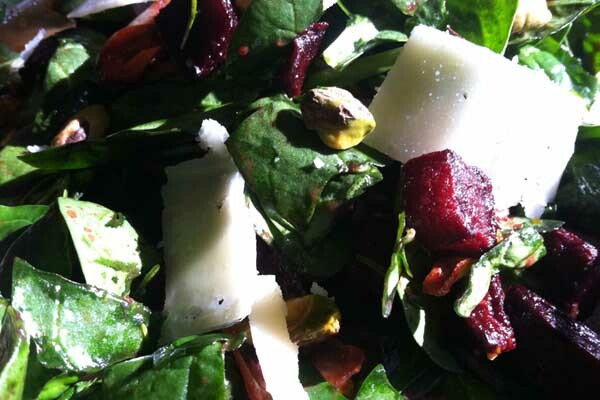 Toss beet leaves and spinach with a bit of dressing and then toss a little dressing with the onions and beets. Place on a platter and garnish with the cheese and pistachios.